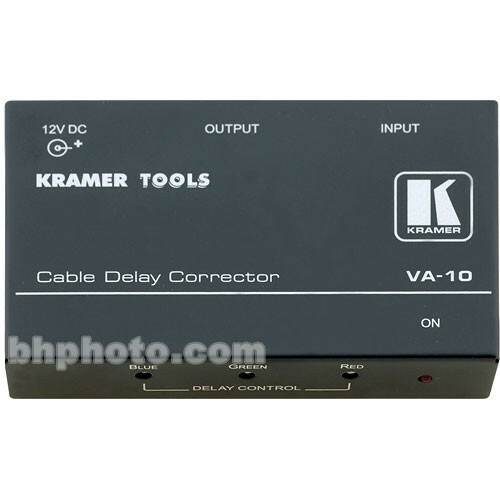 The Comprehensive/Kramer TP-41 Audio/Video Transmitter is a transmitter designed for the long range extension and distribution of a component video and digital audio. This device will convert the signal produced by a DVD player, computer A/V workstation or similar device(s) into signals that can be sent over common and inexpensive twisted pair computer network cabling. This allows a user to cleanly extend their studio, A/V, or presentation applications beyond the short cabling that restricts the spacing of devices. To convert the signal back to a standard YUV component video and S/PDIF audio signal at the other end of your wiring configuration, use the Comprehensive/Kramer TP-42. Power Connect System - Only one unit in a signal path, either the transmitter or receiver, needs to be connected to a power source. All the system units must have Power Connect circuitry to make use of this feature. Twisted pair output can utilize common and inexpensive unshielded RJ-45 network cabling such as CAT5. Box Dimensions (LxWxH) 9.1 x 4.8 x 3.5"